Is there anything more magical than a snow day? I was going to write a new post today, but it’s a snow day. You know what that means: my time is not my own. It’s a fact that the blush comes off some things as you age. It’s all about perspective. • Christmas isn’t so much magical as merely a day to get through without offending a relative. • Quite a few food items actually are better without ketchup. • Ovaltine really tastes kind of gross. And now, in my middle age, I’ve discovered the naked truth about something I cherished as a child, something I yearned for, prayed for, planned my life around: the snow day. They’re not that great when you’re an adult. One night not long ago, as snow piled up outside our house, my husband and I turned on the 10 o’clock news. The temperatures outside were plummeting, Arctic air was barreling toward Kansas City, and school districts were canceling school left and right. My husband chortled. And what could I say to that? “Oh, God, save me,” sprang to mind, but then there’s the guilt of feeling like I would rather shovel the driveway than spend a day inside with my own children. So I just managed a wan smile. I love my kids with all my heart. And before I became a stay-at-home mom, I felt guilty when snow days occurred because I usually couldn’t stay home with my children and cavort in the snow. I begged for child-care help from their grandparents or aunts. But now, snow days seem a lot more difficult than regular school days. Sure, there are no threats to get them out the door by 8 a.m., no swearing to turn off PBS if they don’t eat their Pop Tarts, no fighting over who didn’t put the lid on the toothpaste. We have, instead, children who know instinctively that school is canceled and so rise from bed 30 minutes earlier than usual. They argue about everything. And the begging to go outside begins before breakfast. That’s especially annoying if the temperature is below 20. After that recent snowstorm, I explained to my 7-year-old son that he couldn’t play outside when the temperature was 1 degree. He’d have to wait until after lunch, when I expected it to climb to 10 degrees. I intended to make him and his sister wait until 2, the so-called heat of the day, to play outside. But after lunch, my stamina was waning. So I told them if they bundled up, they could play outside awhile. They headed out the door. Quiet descended on the house, interrupted only by the crying of the 15-month-old, who had donned his boots and wanted out, too, and the dog’s occasional bark. It lasted five minutes. I was in the kitchen when I heard the screaming. “Mom, Mom,” my older son was crying, only it sounded like he was holding his tongue. He bounded into the kitchen, holding his tongue with a hand ensconced in a really dirty glove. I could see blood. “Did you bite your tongue?” I asked, examining it. He nodded. Then I noticed the blood underneath. “Why would that thingy that holds your tongue to the bottom of your mouth bleed if you just bit your tongue?” I wondered aloud. My son closed his mouth. Then he opened it again and explained that he hadn’t been quite truthful. He didn’t really bite his tongue. He had stuck it to the metal railing along the steps to our neighbors’ back yard. His sister had helped him get loose. 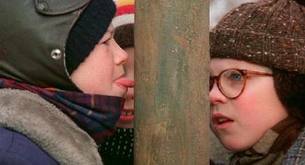 Apparently, all those hours spent watching the movie “A Christmas Story” were for naught. I wanted to laugh, but that wouldn’t have been appropriate, what with the blood and all. So I wrapped an ice cube in a towel and stuck it in his mouth. The bleeding lessened a little, but he was in pain. I called our dentist. You remember this scene, right? After his laughter died down, he told me to monitor the blood. If the bleeding didn’t cease within a couple of hours, he needed to see my son, who’d probably need to eat soft foods for a few days. I hung up the phone. My son stood there looking at me, the towel shoved into his mouth, his eyes hopeful. I stood there looking at him. He wanted to be outside. This was a magical day, a surprise vacation from school. I could remember the joy at such a gift. The bleeding would stop. He promised he would. And as he headed out the door, our big Labrador mix bolted through it, jerking the hat off my son’s head. Later I found a girl’s stocking cap in our driveway, and all afternoon I could hear the screams of the neighborhood children as the dog stalked them for their hats. Someday, I thought, they’ll look back on this day and remember it as a thing of beauty. I, too, will have to reach into the archives at times. What an achievement to have a body of work to go back to my friend. I remember this day. It ended up being fun!